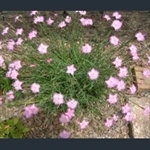 The alpine Dianthus are amongst the staples of the rock garden, providing lots of reliable colour after the first flush of spring flowers has passed. They form neat cushions of thin, pointed leaves, blue-grey in the majority of species, and have short stems, each with a few, wide-open, five-petalled flowers, mostly in the white-pink-red colour range. With over 100 European species, identification is often tricky. Excellent species for the garden, with blue-purple, dark-veined flowers. Glowing deep pink flowers sitting just above grey foliage.